This tiny LED flashlight from Streamlight is super bright, tough, and remarkably handy. It's so compact, you can carry it with you at all times. And it's very powerful. 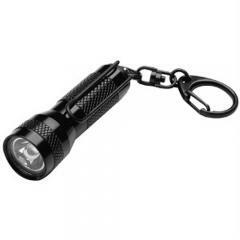 It offers 400% more lighting range than a penlight, and reflector optics that enhance the brightness of the LED (lighting two to three times the range of other keychain lights without optics). I love these. I have one on every key ring and every bag I own. They're small but tough, and pretty much weatherproof. They're perfect for finding the keyhole when the light is out, or for finding your way through a darkened aircraft or movie theatre without disturbing others. The super bright LEDs are so energy efficient that I haven't needed to change batteries of any of mine over the years I've had them. They also make great gifts.